Last week I was inspired by the folk at Evil Mad Scientist Laboratories to make some Sierpinski Cookies. I was pretty sure that they wouldn’t look as good as those (and they didn’t), but they were fun to make. Naturally, Godzilla did most of the work. He’s good that way. 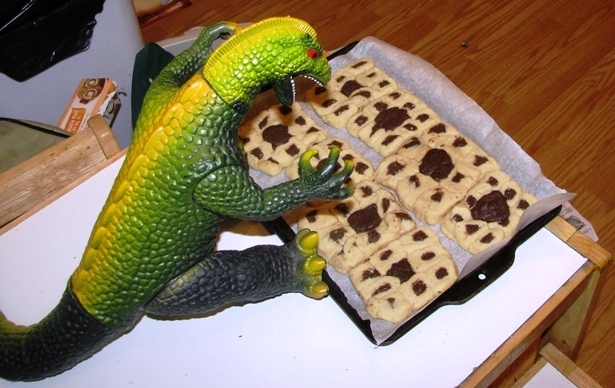 At the suggestion of EMSL above, he used the recipe from Cook’s Illustrated (posted at instructables, where they use it to make pixel cookies). You know you can trust the folk at Cook’s Illustrated because they’re the ones who revealed (to me, anyway) that the secret ingredient in pie crust is vodka. Seriously — using a mixture of vodka and water lets you use more liquid, and the vodka boils off and the crust stays tender. 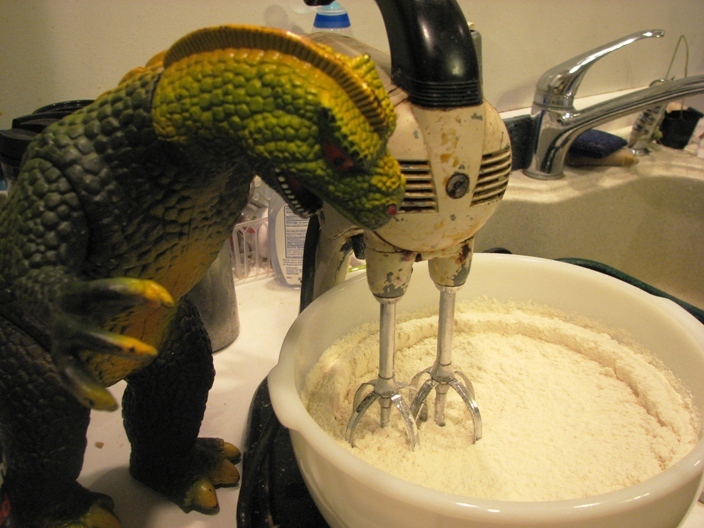 Here’s Godzilla mixing the ingredients. 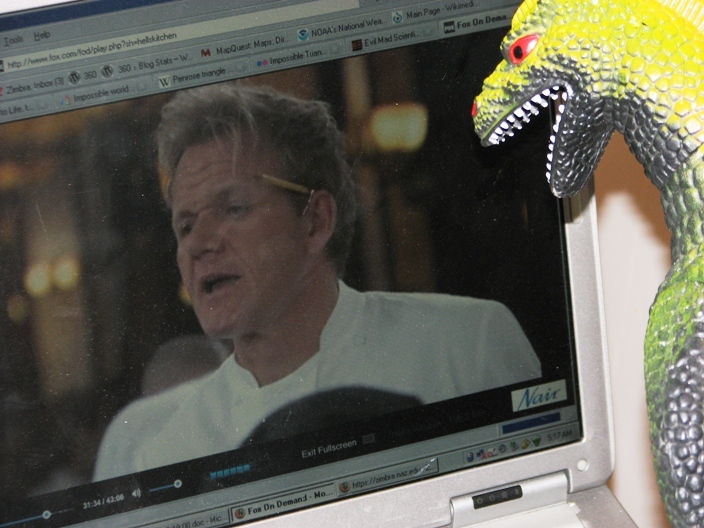 Godzilla likes to take breaks while cooking to watch Chef Gordon Ramsay. Actually, Godzilla spent so much time watching Hell’s Kitchen and trying to imitate GR yelling, “It’s RAW!” that he forgot to pose for photographs of the next part. He made another batch of chocolate dough (again, following the instructions at Evil Mad Scientist Laboratories (and the chocolate dough is amazing. Plus, no raw eggs, for those who worry about such things when eating raw cookie dough)). Then he formed the dough into long square strips, put them together with a chocolate strip in the middle, chopped them up, and put them together again (with a bigger chocolate piece in the middle) and Lo, Sierpinski cookies! See? Not nearly as neat as the originators, but he still thought they tasted mighty fine. 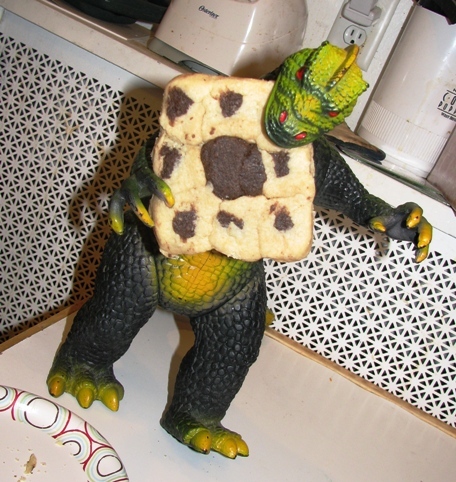 This entry was posted on June 25, 2008 at 12:01 am and is filed under Food, Godzilla. You can follow any responses to this entry through the RSS 2.0 feed. You can leave a response, or trackback from your own site. Glad to see you over here Dave! 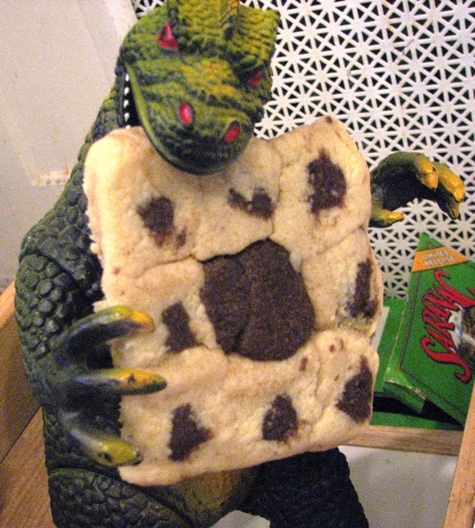 Yes, Godzilla made Super Hero cookies for Puntabulous at the same time as the Sierpinski cookies, and stuck some of both in the care package. He was a busy monster that day! Godzilla’s star is at 6925 Hollywood Boulevard – other stars near that location include Jack Nicholson, Drew Barrymore, Barbra Streisand and Mickey Mouse. This is such a great post. I love it! It is so original and fun. Those are great pictures too! I’ll post it in my facebook fan page. Wow! So we now we know why Big G is so big. No movie had given the secret yet.